The P-10 is the ideal solution for corporate presentations, VJ�s, clubs, houses of worship and sporting events. The sleek and compact design lends itself to portable applications, as well as permanent installations when size and space are considerations. 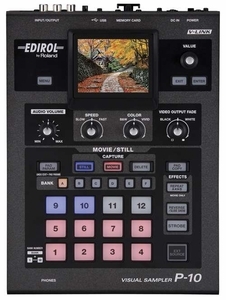 The P-10 is also the perfect compliment to the newly released EDIROL V-8 Eight Channel Video Mixer as a dedicated input source for video performance and playback. Capturing media from various sources (video decks, DVD players, digital cameras, etc) is extremely easy. Video is stored as Motion JPEG and still images as JPEGs. 72 banks with 12 pad sets offer the storage and quick recall of up to 864 clips. Linking with V-LINK devices is easy. With one simple connection, real-time multi-media performance from a variety of instruments is yours. Playback modes like Reverse, Strobe or Motion Control provide impressive effects for your audience. Slide Show enables animation from multiple still images. Import or export media files via USB. Free software for format conversion is included enabling easy conversion to P-10 compatible video files. The sampler-like interface of the P-10 lets you perform visuals as if they were music. Self-lit pad buttons enhance playability on dark stages or at Front of House. You can easily capture video or still image materials from digital still cameras, video cameras or computers. Enjoy real-time visual performance with your captured media. The P-10 provides easy and intuitive playback with its pads and bank selections.. V-LINK enables synchronized performance of audio and visuals. For example, synchronized playback with a sampler like the Roland SP-555 enables visual output in sync with the sampler�s audio output. Cleverly synchronized sounds and visuals will deliver compelling and dramatic presentations.